The project is divided into 10 work packages. The Work Package 1 aims to determine the dietary characteristics and daily food intake patterns of older adults by appetite and malnutrition strata, how they relate to the development of malnutrition and relevant clinical outcomes, such as frailty, functional decline and quality of life, and to determine how daily physical activity and sedentary behaviour patterns relate to daily food intake patterns in older adults. It is led by the University of Newcastle. We have been examining the impact of low protein intake on clinical outcomes in older adults, specifically incidence and progression of disability and incidence of frailty. We are combining all the national surveys and cohorts in PROMISS to characterise the extent of low protein intake among older adults. 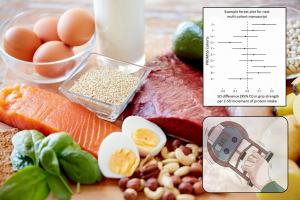 The next multi-cohort paper will examine protein intake and muscle strength by pooling individual participant data from all cohorts within PROMISS. We are also determining how appetite can vary by physical function in the Icelandic cohort. The Work Package 2 aims to determine daily physical activity, sedentary behaviour and nap/sleep patterns of older adults; to investigate potential differences in these patterns between appetite strata and malnutrition strata; and to examine the impact of demographic, socioeconomic, lifestyle, physical and psychological health factors on these patterns. It is led by the University of South Denmark. We examined preliminary results from WP2 lab study (Task 2.2) which aims at identifying whether physical activity data collected with accelerometers worn at three different anatomic locations (wrist, hip and thigh) can be pulled and analyzed together. We used the assessment of energy expenditure synchronized with accelerometers wore on hip, wrist and thigh during semi-standardized activities of daily living (ranging from resting to VO2 max) in 80+ older adults. We decided to add to the lab study the assessment of energy expenditure (with doubly labelled water method) during free-living conditions for 14 days while wearing multiple accelerometers. With this new method, we aim at identifying whether energy expenditure collected over a longer period of time during unrestricted free-living activities may correlate better with accelerometers placed at different body locations. This additional method may allow us to develop an appropriate algorithm and translate “counts” recorded from different anatomic location into a common metrics (e.g. relative intensities, volume, fluctuation of activity level during the day). We have received approval from the ethical committee for amendment of the lab study, and recruitment is scheduled to start in February 2019. The Work Package 3 aims to determine the association of the oral microbiome with appetite and malnutrition and with taste and smell capacity in older adults. It will also look at the association between faecal microbiota with appetite and malnutrition in older adults. It is led by the University of Gothenburg. The Work Package 4 aims to quantify specific attitudes and preferences of older adults, as food consumers, with regard to dietary and physical activity characteristics and daily patterns according to appetite and malnutrition strata. It is led by the Ghent University. The Work Package 5 aims to develop sustainable, feasible and (cost) effective dietary and physical activity strategies to prevent malnutrition and support active and healthy ageing, and to develop modern technological solutions to support older adults in making healthy choices that fit within these strategies. It is led by Blonk Consultants. The Work Package 6 aims to determine the feasibility of dietary and physical activity strategies developed in WP5 and of new food products developed in WP7, and to determine the feasibility and short term impact of persuasive technology to support adherence to dietary and physical activity strategies. It is led by the VU University of Amsterdam. The Work Package 7 aims to develop new food products and food concepts that fit within the dietary and physical activity strategies that PROMISS will develop to prevent malnutrition and support active and healthy ageing. It will also develop a roadmap for the food industry including SMEs to guide the development of new food products and concepts for older adults, and a master class to support the food industry including SMEs, to provide scientific input on dietary characteristics, daily food intake patterns and link with clinical outcomes of older adults, the attitudes and (sensory) preferences regarding food and activity patterns of older adults, and the sustainable dietary and physical activity strategies developed in PROMISS. It is led by VIVES. The Work Package 8 aims to determine the long term (cost) effectiveness of dietary and physical activity strategies on incident malnutrition, frailty, functional decline and quality of life in older adults at risk of malnutrition, and to establish the long term impact of persuasive technology on the adherence to dietary and physical activity strategies. It is led by the University of Helsinki. The Work Package 9 aims to give visibility to the PROMISS project and raise awareness on its objectives and activities. It will also take care of the translation of the dietary and physical activity strategies that PROMISS will develop into clear recommendations by and for different stakeholders to facilitate future translation into practical tools, clear guidelines and training materials for all EU countries. It is led by AGE Platform Europe. The Work Package 10 aims to efficiently manage and coordinate PROMISS so that the objectives in the other WPs can be achieved. It is led by PROMISS Coordinator, the VU University of Amsterdam.